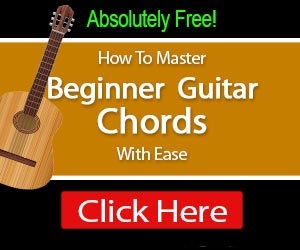 Seven easy chords you need to play thousands of songs. In this lesson we’re going to loosen up our fingers and start building calluses with some basic guitar chords. These common shapes are the same chords players like Bob Dylan, Peter Buck, and Dave Matthews use as the foundations for many of their songs. 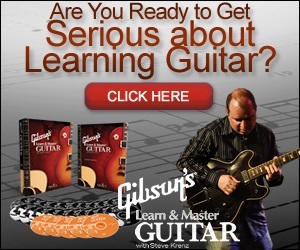 Let’s start with what may be the most used chord in the entire guitar repertoire: the G chord. 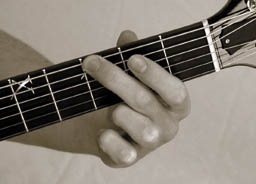 Begin by placing your middle finger on the sixth string at the third fret, as shown in the photo below. Hold the string firmly against the fingerboard just behind the metal third fret. Pluck the string and make sure it rings clearly without any buzzing or rattling. If it does buzz, press more firmly or position your finger closer to the fret. 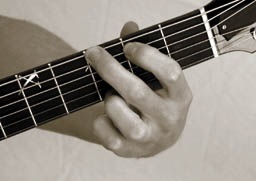 While leaving your middle finger in position, place your index finger down at the second fret of the fifth string, and then press your ring finger down at the third fret of the first string. The ring finger will be the hardest to get into place. Just experiment with your hand position until all three fingers can be held in their proper places comfortably. Compare your fingers with the photo below. Now pluck each string one at a time beginning with the low sixth string. Make sure that each note rings loud and clear, including the open strings (second, third, and fourth). Chords are commonly displayed in printed form through diagrams. Look at the diagram of the G chord. Compare the chord diagram with the photograph of a G chord. The vertical lines represent the strings of the guitar with the sixth string on the left. The horizontal lines are the frets, and the thick horizontal line at the top of the diagram is the nut. 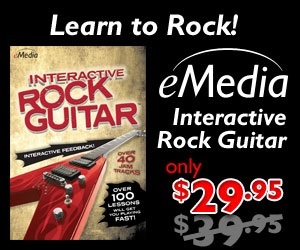 Hold your guitar in front of you with the neck pointing straight up to see the perspective shown in the diagram. The dots represent finger placement, and the numbers across the top indicate which fingers are used: 1 = index, 2 = middle, 3 = ring, 4 = pinky, 0 = an open string. Copyright 2015. Guitar PP China Inc. All Rights Reserved.